The visionary Russian filmmaker Alexander Sokurov works with a single conceit in this spare film about the Russian occupation of Chechnya—an incongruous image of an old woman among young soldiers in a Russian army camp. The woman, Alexandra, has come to a desolate military outpost inside Chechnya to visit her grandson, a captain in the Russian army who is stationed there. She’s an archetypal grandmotherly type, the kind chiseled by World War II and hardened by its aftermath, one who puts up with no nonsense, and yet still exudes warmth, tenderness, and a weary sadness. Large, big-breasted, gray-haired and cranky, Alexandra is constantly complaining about the heat, the smells, and how the boys need to take more showers. She also goes where she damn well wants, and sits whenever she damn well wants, which is often, because, being over 80 years old, she tires easily. No matter how often the soldiers fuss over her and warn her of inherent danger, she huffs at them and then shuffles on. “Get away from me,” she snaps at them, and then offers them meat pies because they look so hungry. We are nonetheless kept alert in this filmic dream state by the captivating presence of Galina Vishnevskaya in the role of Alexandra. A famous classical singer of the Bolshoi Theater who defected to the West in 1974, Galina Vishnevskaya was known as a powerful dramatic soprano, and that bravura, that sense of energy and risk-taking translates easily to the screen. Even weighted and slowed down by age, she is spellbinding. Her face is almost youthful in its expressiveness, and she uses every bit of her imposing body for dramatic effect, even when still. Watching Miss Vishnevskaya is like letting yourself soak in a bath of warm water—the more you look at her, the better you feel. There is also some interesting dialogue to punctuate an otherwise laconic script. 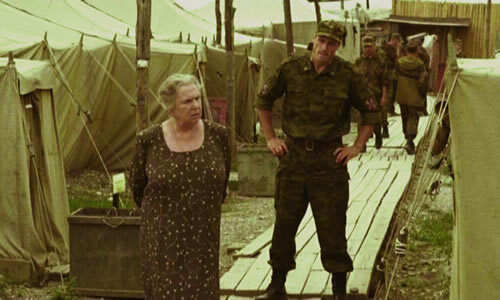 One conversation between Alexandra and her grandson near the film’s end delivers a poignant confession of the loneliness and fear of old age, and some insight into the irrational roots of bigotry—here, the Russian Slavs let out their racist feelings towards the Caucasians who inhabit Chechnya, and it sounds just like intolerance of ethnic difference anywhere. There’s also a scene where Alexandra walks to a market in the nearby town, and is befriended by a Chechen woman, who takes Alexandra to her home in a bombed out building where she serves her tea. This scene of civility and hospitality in the wreckage of war is very moving—a bit of lucidity in an otherwise comatose mental landscape. Despite its visual poetry and its allegorical intensity, Alexandra still comes off as a trifle that lingers on the surface of things, showing the rubble and stone-faced aftermath of humanity’s tendency towards violence, and leaving the complicated forces that drive it unexamined, like dwelling on the tip of an iceberg, and ignoring the bulk that lies underneath. Such a pared-down, archetype-driven form of expression might make for a more pristine cinematic aesthetic, but sometimes a mess might be a better way of getting at the truth.